Queen City Lodge No. 761 will participate in the TN CHIP Program at the Annual Rivers & Spires (Spring) and Riverfest (Fall) by operating a Vendor’s Booth at these annual events. 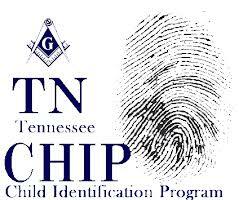 TN CHIP was established to raise public awareness concerning the risk of abduction or exploitation that our children now face in today’s society. At each TN CHIP Event parents are provided, at no cost, a Complete ID Package that has been designed to provide a thorough description of their child. Each Id Packet contains vital identifying items for a child such as comprehensive identification questionnaire, hair samples, DNA sample, etc… The ID packets are retained by the parents and each parent is encouraged to annually update their child’s ID kit as they grow with a current photo and any other pertinent information about their child that may aid Law Enforcement Agencies in the recovery of their child should the unthinkable ever happen.